To navigate the Personnel section, all veterans are grouped alphabeticaly by the first letter of their last name. Click on the links listed below to take you to the correct alphabetical group. The following information on the Squadron Personnel has been collected from numerous sources. In many cases there is very little information known except bits and pieces, but what is known will be collected here. We do not regard any information as trivial, the tiniest shred of information very often connects a bigger piece of the puzzle. The intent of this section is to record the personal experiences, stories and career of each 113 veteran. It is a place for us all to learn something about who they were, and a place where they, their family and friends can share and perserve any memories or stories they might have for future generations. If you, or someone you know served with the 113 Squadron, please take a few moments of your time to share what you know and help with this project, it is such a small thing to give back. RANK: Rank is one of the hardest things to get right in assembling the history of the squadron. This is because final rank can not be used as it would be too confusing being out of context to the time of the event. ie: you would have F/Lt's and W/Cdr's sitting around the sargeants mess. As a result you will note that the rank of any individual varies throughout the site depending on their rank at that moment in time. In very many cases the rank indicated will be too high or too low. IMPORTANT NOTE: Flights or parts of flights might have been detached to other airfields for specific ops but the base, where the ground crew and Admin were, often stayed put, for example. John Reid in his letter said that raids against Arakan targets were almost always via Dum Dum to top up with gas and sometimes for special briefings. Raids against Central Burma targets, such as Mandalay were via Agartala for topping up. Beginning early in 1942 a significant number of 45 Squadron Personnel were posted to the 113 Squadron. This ocurred a few at a time throughout 1942 up untill October when a large group posted in. At this time 45 Squadron had been nearly wiped out and had few remaining aircraft, the personnel being posted to 113 untill replacement aircraft could be obtained for 45 Squadron. 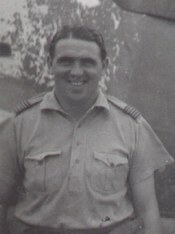 According to Wal McLellan the ex-45 Squadron crews when told to report to Yelehanka immediately as 45 was re-forming, were overjoyed as their stay with 113 had not been a happy one. 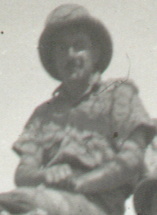 02/05/1942 - S/Ldr Penny posted in along with his Obo F/O Bruce. 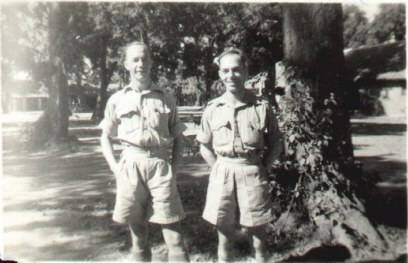 07/07/1942 - S/Ldr Beeston posted in along with his Obo F/O Fraser and gunner P/O Mills. 24/10/1942 - Gus Alder posted in. 25/10/1942 - F/S Armstrong pilot and his Obo F/S Tibbs posted in. 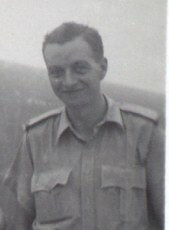 27/10/1942 - Sgt Biggs, F/S F E Thompson RCAF, F/S Jewell, F/S Hallett, Sgt Shatlock RAAF, Sgt Neil RAAF, Sgt Romans, Sgt Terry, Sgt Hatherley RAAF, F/O Corbett RAAF, F/S Levings RAAF. Pilots - McLellan, Shatlock, Taylor, Neil, Jewell, Armstrong, Thompson. Obo's - Levings, Tibbs, Lallert, Kerns. WOp/Ag - Nankervis, Hatherley, Romans, Terry, King, Whittaker, Brown, Barclay. NOTE: This is only a partial list and there is much confusion as to who stayed and who left. Some who were known to have posted in, do not seem to have gone on any Ops with 113 during their short stay and as such are not profiled in the PERSONNEL SECTION. Those who did are profiled but only where information exists indicating they were involved in operations or other activities of the 113. The list of names and or pictures that follows in this unidentified section are those that have not been confirmed as members of the squadron, are only partially identified, or there is no information on at all. If you recognize a name or picture here, even if your unsure, please contact the site. We do not regard any information as trivial, the tiniest shred of information is often all it takes. 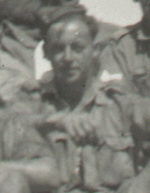 1/ Friends of Sgt Bernard Shelton AC1 who he shared a tent with and were identified in a letter home. All were at Ma'aten Bagush at the start of the desert war with the Italians in 1940. Cpl. "Mac" McClellan, "Charlie" Buttle, "Pincher" Martin, "Dutch" Taylor, "Pig" Malyon, "Tubby" McKinley, "Balloon" Berridge, Bernard Shelton was known as "Chicko". 2/ Friends of F/Sgt Gerard Brigden, John Skelley (spelling may not be correct) Another was an Irishman who took a commission after the war in India and was burned by acid thrown on him. PORGES Rudolf /POLAN/, LAC, 788652 , 113 Sqdn, ppor./R/mjr. 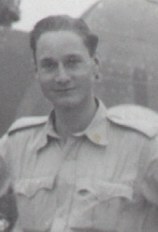 01-Jan-03, 09:48 PM (GMT) "113 Squadron"
8/ A S/Ldr Norman Ford was awarded AFC on 01/07/1941 and was presented 26/05/1943, records on AWM web site state he was with 113 Sqd. FOUND S/Ldr Le-Franais the Medical Officer. Came from the north east. L.A.C. Muirhead " " Came from Edinburgh as I did. L.A.C. 's Gunn, Dracup, Gould, Paynter, Fletcher, Price (Blackburn). 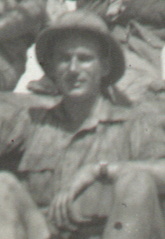 10/ Corp Norman (Mark) Lamb friends. 11/ Can you identify these faces below? late 1942 to mid 1943. These three may or not be crew. Sitting on Belenheim V along with Theobald, Ward & Gilchrist who were lost on ops 06/06/1943. Crew photo can be seen in photo section. late 1942 to mid 1943. Background is a Blenheim V. Crew photo can be seen in photo section. Possibly Lt Bodley SAAF on left??? late 1942 to mid 1943.